Copies of a suggested book about the Eucharist for Lenten reading, by Fr Armand de Malleray FSSP, are available at £10 in the hall. Our thoughts and prayers go with Nick and Kerrie Ross, who moved to Nottinghamshire this week. Nick has been invaluable as MC and as Latin Mass Rep for the diocese over the past two years or so. Sunday 7th April at 12.30 pm in the parish hall. £5 per ticket; reductions for families. Proceeds to CAFOD. Regina Caeli Academy, opening September 2019, is holding an Open Day on 13th April in Barton. More details are at http://www.rcahybrid.org.uk. Get ahead of the game in time for Lent! Apologies for the lack of an entry for last weekend but I had just moved house! Some of our congregation say the Rosary in church starting a few minutes after the end of Mass. This is optional, but please stay and join in if you would like to. Mass with Imposition of Ashes this coming Wednesday 6th March at 7.30 pm. Fr Goddard has produced some practical suggestions for Lent – a sheet is available at the back of church and in the hall. Copies of a suggested book about the Eucharist for Lenten reading, by Fr de Malleray FSSP, are available at £10. Sunday 7th April at 12.30 pm in the parish hall. Proceeds to CAFOD. Nicholas Dyson has kindly offered to train any boy who would like to learn to serve Low Mass, by being with him in the sanctuary and “learning on the job”. Nicholas is usually in the hall after Mass and would be pleased to meet you. Today, Septuagesima, sees the start of the pre-Lent period, perceived very obviously in musical terms by the lack of Gloria in the Ordinary and the disappearance of the Alleluia from the Propers. Sung Masses today and on 24th February will include Mass IV and a Creed melodically evocative of the penitential season – also no. IV. Please note that I am going to give a talk on Gregorian chant on Sunday 24th March, from 10.30 – 11.30 in the Patrick Donegan Room. It will be a multimedia presentation with slides and musical examples. All welcome! Matthew Schellhorn, Director of Music. The Spring edition, issued by the Latin Mass Society, is available in the hall today. Please take your free copy. If you don’t already belong to the LMS, please consider joining to support the development and spread of the Extraordinary Form of the Mass. New leaflets are available at the back of church and in the hall which detail the various types of membership and give more information about the work of the LMS. Hard copies of the full news sheet are available at the back of church and in the hall. A Rosary will be said in church immediately after Mass. Please stay and join in if you can. Director of Music, Matthew Schellhorn, will be with us next Sunday, 17th February, to sing and play appropriate liturgical music for Septuagesima. If you don’t already belong to the LMS, please consider joining to support the development and spread of the Extraordinary Form of the Mass. New leaflets are available at the back of church and in the hall which detail the various types of membership and give more information about the work of the LMS. This news sheet is available at the back of church and in the hall afterwards. To ease congestion in the car park, additional spaces have been made available on the strip of lawn beside the Presbytery at the back of the Church. Please avail of these spaces. A Rosary will be said in church immediately after Mass. If you are able to stay and join in, you are very welcome to do so. There will still be time for coffee afterwards! For those who wish to take some home, this year’s Epiphany water is available at the back of the church today. Our series of First Sunday Catechism continues today, 3rd February, starting at 10.30 for the under 8s, 11.00 for the under 16s and 11.30 for the adults. Listen out for the bell which marks the beginning of the session! Please note that in this form of the Mass, the Church asks us to receive Holy Communion on the tongue and – if physically able – kneeling. Confessions are available before and after Mass. Refreshments are available in the church hall after Mass – please come and join us, especially if this is your first visit to Christ the King. All but £50 of our Latin Mass collection money goes to support Christ the King Parish. If you would like to help to ensure the continuing presence of the FSSP at Bedford, please consider setting up a standing order to them. These need to be set up by you through your bank: account name: FSSP England (Reading); sort code 30-93-04; account number 02027330. Gift Aid forms are also available by request. Thank you. What is known about the life of St. Blaise derives from various traditions. His feast day is celebrated in the East on February 11th and in the West on February 3rd. All sources agree that St. Blaise was the Bishop of Sebaste in Armenia who suffered martyrdom under Licinius about AD 316. From here, we rely on the tradition which has been associated with our liturgical celebrations over the centuries. 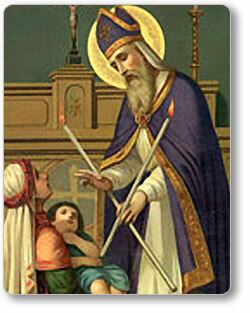 St. Blaise was born to rich and noble parents, and received a Christian education. He was a physician before being consecrated a bishop at a young age. During the persecution of Licinius, St. Blaise moved from the town, and lived as a hermit in a cave. Wild animals visited, and he healed any that were sick and wounded. One day, a group of hunters gathering wild beasts for the games in the amphitheatre discovered St. Blaise and seized him. As he was being taken to the governor Agricolaus, St. Blaise encountered a woman whose pig was being seized by a wolf; St. Blaise commanded the wolf to release the pig, and it was freed unhurt. While in prison, he miraculously cured a small boy who was choking to death on a fishbone lodged in his throat. Also, the woman whose pig had been saved brought St. Blaise candles so that his cell would have light and he could read the sacred Scriptures. Eventually, Agricolaus condemned St. Blaise for upholding his Christian faith rather than apostatizing. He was tortured and finally beheaded. By the sixth century, St. Blaise’s intercession was invoked for diseases of the throat in the East. As early as the eighth century, records attest to the veneration of St Blaise in Europe. One reason for St. Blaise’s popularity arose from the fact he was a physician who cured, even performing miraculous cures. Thereby, those who were sick, especially with throat ailments, invoked his intercession. Eventually the custom of the blessing of throats arose, whereby the priest held two crossed candles over the heads of the faithful or touched their throats with them while he invoked the prayer of the saint and imparted God’s blessing. While we invoke St. Blaise for his protection against any physical ailment of the throat, we should also ask his protection against any spiritual ailment — profanity, cursing, unkind remarks, detraction or gossip. St. James reminds us, “If a man who does not control his tongue imagines that he is devout, he is self-deceived; his worship is pointless” (1:26) and later, “We use [the tongue] to say, Praised be the Lord and Father’; then we use it to curse men, though they are made in the likeness of God. Blessing and curse come out of the same mouth. This ought not to be, my brothers!” (3:9-10). Therefore, may St. Blaise protect us from all evil, physical and spiritual, which may attack the throat.